There are several facilities available at the Great Falls Shooting Sports Complex. 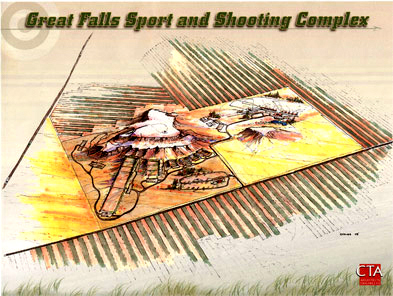 In 1995 Terry Hill was approached by several area sportsmen about the need to develop a shooting complex that would serve the region around Great Falls. With the permission of his employer the Montana FW&P, Terry began to work on this with several area groups. Later the Beckman property was located and the wheels of progress started turning. LeRoy Beckman wanted to leave almost 1000 acres he owned north of Great falls to help perpetuate conservation of mule deer, and so that sportsmen could continue the pursuit of mule deer. In 2000 Jim Panagopoulos became involved through his involvement with MRSA. These two gentlemen along with many others started the process to obtain land for the sportsmen and women of the Great Falls area. This took years and thousands of hours of meetings and hard work. On June 18, 2003 Jim Panagopoulos signed the lease agreement with Mt. FW&P and finally the GFSSC had the property needed to build ranges on. This would not have been possible if not for several generous donors. The Mule Deer Foundation and the Wild Turkey Federation each donated $20,000 towards the purchase of the property. In addition, Scheels Allsports donated a total of $22,000, a large portion of which went to make the classroom building the year-round education facility it is today. Pheasants Forever Upper Missouri Chapter donated $6,400, Pacific Steel & Recycling donated $2,500, and over 20 individuals purchased Life memberships at $1,000 each. The construction continues as money and labor allow.